With three months to go for simultaneous elections to the Andhra Pradesh Assembly and the Lok Sabha, the ruling Telugu Desam Party and the main opposition YSR Congress Party are bracing for what is expected to be a keen tussle. With his 14-month-long ‘padyatra’ or walkathon, Leader of Opposition Y.S. Jaganmohan Reddy has infused enthusiasm among the YSR Congress Party (YSRCP) cadres while Chief Minister N. Chandrababu Naidu continues to shock his main opponent with calculated moves. Jagan, as the YSRCP chief is popularly known, last week concluded his ‘padyatra’ at Ichchapuram in Srikakulam district bordering Odisha. His foot-march covered 3,648 km, claimed to be the longest walkathon undertaken by any politician in India. Known for mingling with people and developing an instant rapport with them, Jagan heard their problems in every village he visited and promised what YSRCP will do if voted to power. Jagan hopes to repeat what his father and former Andhra Pradesh Chief Minister Y.S. Rajasekhara Reddy (YSR) had achieved in 2004 – covering 1,450 km across in then undivided Andhra Pradesh catapulting Congress to power and ending Chandrababu Naidu’s nearly decade-long rule. Rajasekhara Reddy, however, died in a helicopter crash in September 2009 soon after the Congress was returned to power. Surpassing his late father in terms of the distance covered, the 46-year-old Jagan is now aiming to unseat the same Chandrababu Naidu. 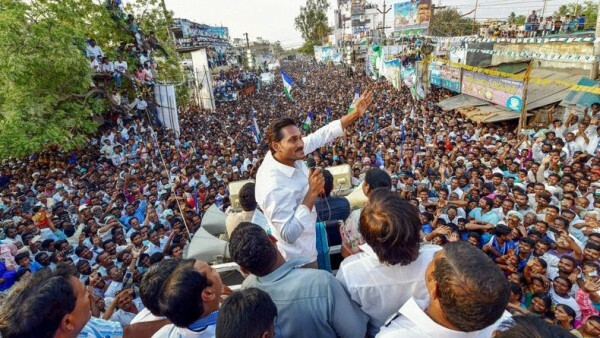 Heavily banking on his late father’s legacy but lacking YSR’s charisma, Jagan faces a daunting task. Naidu, a shrewd politician, is using every trick in the book to checkmate Jagan. The TDP chief, who had accepted the special package announced by Narendra Modi government in lieu of special category status, stunned all by taking a U-turn on the issue and walking out of BJP-led NDA government last March. Naidu, who last year completed 40 years in politics, apparently realised that the YSRCP, by taking up the issue of special category status may queer the pitch for the TDP. Accusing Modi of betraying the people of Andhra Pradesh, Naidu also labelled Jagan as Modi’s agent. However, Naidu’s biggest gamble came when he joined hands with the Congress, a party which was number one enemy for him and for TDP for 36 years. Defending this as a democratic compulsion, the 68-year-old embarked on bringing together all non-BJP parties for an alliance at the national level. He, however, failed in his first attempt as the alliance-led by the Congress faced a crushing defeat in last month’s Telangana elections. Undeterred by this, Naidu continued making fast moves in Andhra Pradesh to keep up the pressure on Jagan. In the latest move, the TDP leader enhanced the social security pensions, a promise made by Jagan during his ‘padyatra’. With the YSRCP chief ridiculing Naidu’s plans to develop capital city Amaravati remaining confined to designs for the last five years, the Chief Minister has speeded up the works in recent weeks to reiterate his determination to build a world-class city even without support from the Centre. Targeting Modi and Jagan on the one hand and calculated moves to stem any anti-incumbency on the other, Naidu is confident of not only retaining power but also winning a majority of the 25 Lok Sabha seats from the state to once again play a key role in the national politics. YSRCP leaders, however, believe there is a groundswell of public anger against the TDP. “The TDP may be reduced to single digit. This may seem an exaggeration but it is not, going by the strong anti-incumbency sentiments,” claimed Shaikh Mohammed Iqbal, a retired police officer who joined the YSRCP a few months ago. With Naidu no longer enjoying the backing of BJP and actor-politician Pawan Kalyan, Jagan hopes the changed political scenario would help the YSRCP to come to power. In 2014, the TDP had bagged 102 seats in 175-member Assembly but its vote share was just two percent more than that of YSRCP, which secured 67 seats.